Craft lagers have been a steadily growing trend for a few years now, but it’s not often you find a pilsner with actual buzz around it. That’s usually reserved for barrel-aged stouts or hazy IPAs or fruited sours—the rare exception is Hood River, Oregon’s pFriem Pilsner, which numerous brewers and beer industry folks have told me, without hyperbole, changed their mind about American lagers. And it’s not some one-off, special release only available under the waxing crescent moon on the third Thursday of the month—it’s available year-round. This German-style pilsner (a style near and dear to my heart) has not only a cult industry following, but medals to back it up: a silver at Great American Beer Festival in 2015, a gold in the North American Beer Awards last year, a silver last year at the Brussels Beer Challenge. I’d put it up there with Firestone-Walker Pivo Pils and Heater-Allen Pils—what’s up with the West Coast’s lock on delicious pilsners?—as one of my favorite American-made lagers, and now is the perfect time of year to drink it. So what makes it this beer so damn special? First, its ingredients and brewing technique are spot-on. There’s imported German pilsner malts, plus a blend of European hops including Perle, Saphir, Tettnang, and Spalter Select. pFriem Pilsner also boasts one of the squeaky-cleanest fermentation profiles you’ll come across, meaning all those high-quality ingredients really come to the fore. But then there’s the X-factor, the je ne sais quoi that marks this pilsner as different and makes it so pleasurable to drink. Its nose is mostly earthy-floral thanks to that bouquet of Euro-origin hops, giving it an aroma like a clover meadow after a rainstorm. It’s pastoral, but refined. The sip is all brioche-bread malt sweetness first, then peppery hops tap dance across the palate before taut bitterness pulls the whole flavor closed. The finish is clean and direct, but not jarring; each sip invites another. I really can’t say enough about how much I like this dynamic 4.9-percent quencher of a beer. I drink it on the back porch on a sunny afternoon; I’ve served it with salads and first-of-spring grilled veggies; I’ll gladly turn to at the end of a night when my palate’s exhausted by bolder, heavier beers. If you live in the Pacific Northwest where you have access to this beer year-round—and on draft!—consider me exceptionally jealous. 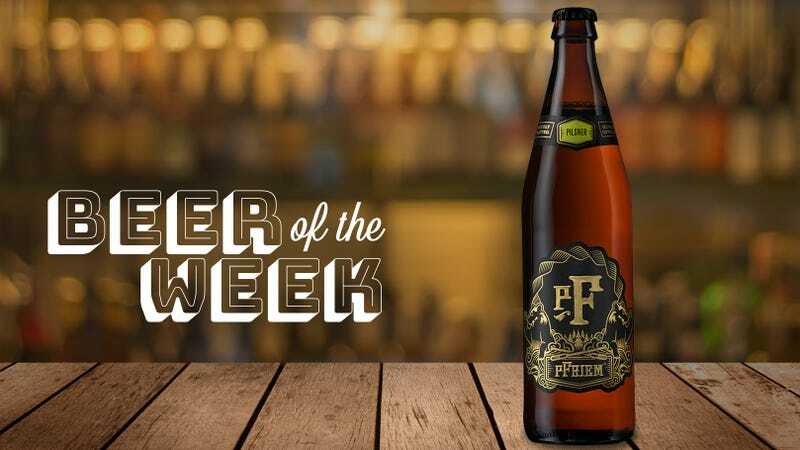 pFriem Family Brewers beers are distributed to Oregon, Washington, and a small portion of British Columbia.